Maddie Slater rises for a block. The senior middle blocker notched her 300th career block on Friday against Iowa. Northwestern might have suffered another 0-2 weekend, but there were some bright spots. The Wildcats (8-16, 1-11 Big Ten) were swept at the hands of No. 1 Nebraska (20-1, 11-1) on Saturday, 25-20, 25-11, 25-20, after dropping a match Friday to Iowa (17-7, 7-5), 25-22, 25-18, 16-25, 26-24. NU played several competitive sets against the Cornhuskers, but ultimately couldn’t keep up with the nation’s unanimously top-ranked team. Freshman libero Sarah Johnson said the problems started with passing. 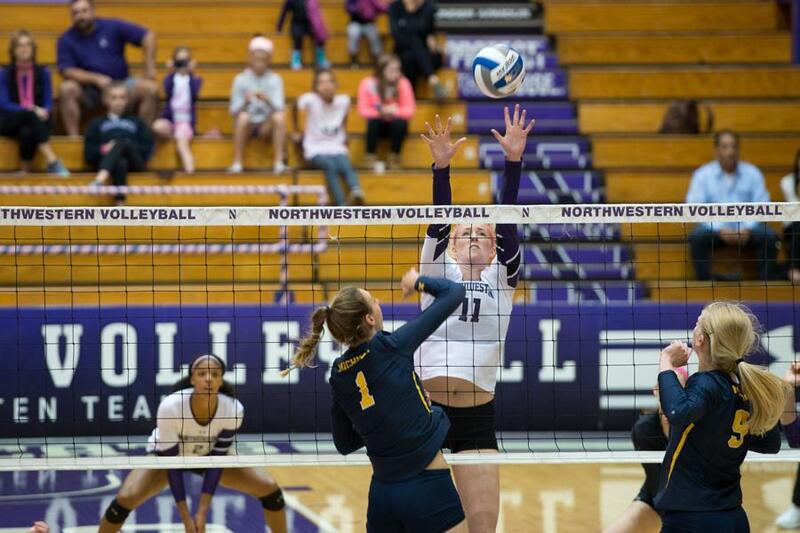 NU never established itself at the net in the match. The Cats didn’t have a single hitter with double-digit kills Saturday, and only managed six blocks as a team. Nebraska hit an outstanding .308, while NU hit just .124. Senior middle blocker Maddie Slater said the Cornhuskers overpowered the Cats with their serving. The Hawkeyes edged NU on Friday under questionable circumstances. The Cats had two points overturned on video review in the fourth and final set, including an overturned kill by junior outside hitter Symone Abbott that would have given NU the set win. Unlike Saturday’s match, the Cats’ play at the net helped the team stay competitive with Iowa, as they had 14 blocks in the match. Junior setter Taylor Tashima and junior middle blocker Gabrielle Hazen led the way with seven, while Slater chipped in six. NU also had three hitters with double-digit kills, led by Abbott’s 12. Despite failing to find a victory, the Cats continued to build on their upset win over Purdue last weekend. On Friday, they won a set for only the second time since Sept. 21 at Indiana. Davis said he likes the way his team is competing. Johnson said despite a 1-11 start to the Big Ten slate, NU is still optimistic.